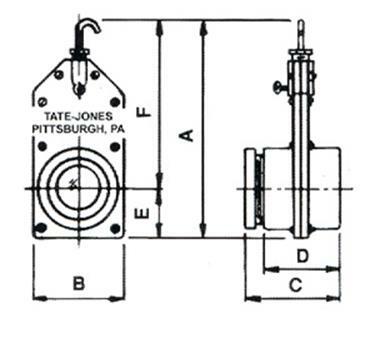 Threaded Blast Gate Observation Ports – Tate-Jones Inc. The Blast Gate Observation Ports use the Tate-Jones standard line of blast gates as the primary component and incorporate a glass lens, gaskets, and rings that are securely retained with a metal bushing. The stainless steel slide arrangement in the blast gate gives added protection and life to the lens during operation, and allows maintenance to be performed with added safety during vessel down-time. Additional cooling can be obtained by adding a purge connection on the glass or vessel side of the blast gate housing. Stanadard purge is at 3 o’clock but may be customized upon request. Threaded sizes range from 2″ to 6″ NPT threaded openings. Three choices of glass are available for varying temperature exposures and viewing requirements. The standard unit is a Class 30 gray iron with maximum temperature of 425 °F. Custom units made from Carbon Steel and Stainless Steel by special order.